We know that the most important thing for families who live with dogs is to offer them safe and top quality products that take care of their health. 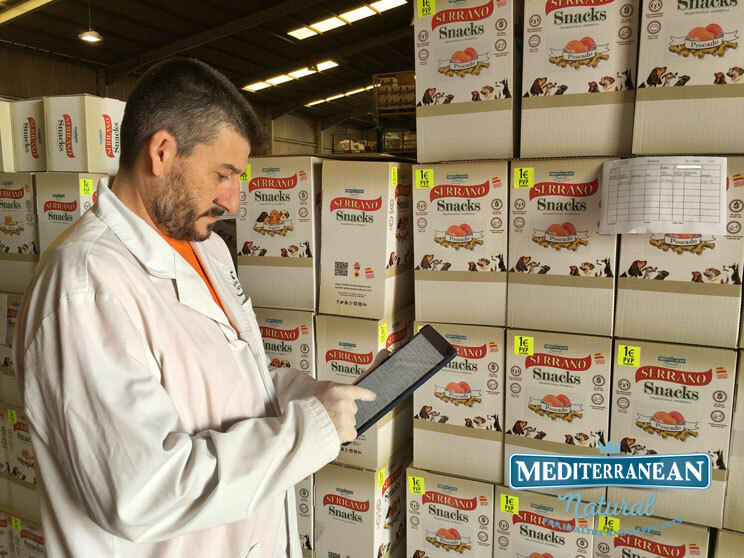 The Mediterranean Natural group are committed every day in responsible and efficient work, in order to produce the best treats and food for dogs. Due to the collaboration agreement signed with the Department of Physiology of the Faculty of Biology (University of Murcia), we have improved the formulation of our products and our production system. 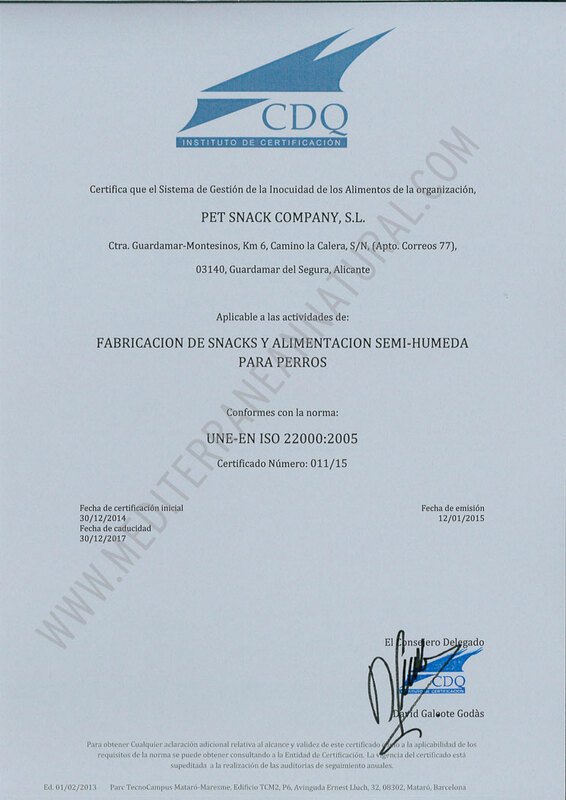 The effort made over the years and the rigor in quality and food safety has earned Mediterranean Natural the ISO 22000/2005 accreditation, which has enjoyed since December 2014 and it represents an international recognition of compliance with safety requirements and food quality and ensures the safety of our dog food. ISO 22000 is the international standard for food safety management systems for the entire supply chain, from farmers and stockbreeders to processors and packaging, transportation and point of sale. This is a valuable guarantee in terms of food safety (equivalent to BRC and IFS), which is highly appreciated worldwide and serves to accredit those companies that comply with strict international ISO standards and, therefore, offer a Safe and quality product. This accreditation is very important for Mediterranean Natural, since it implies an improvement and continuous updating in the security processes, it offers greater transparency on our manufacturing systems and enables new business opportunities around the world. 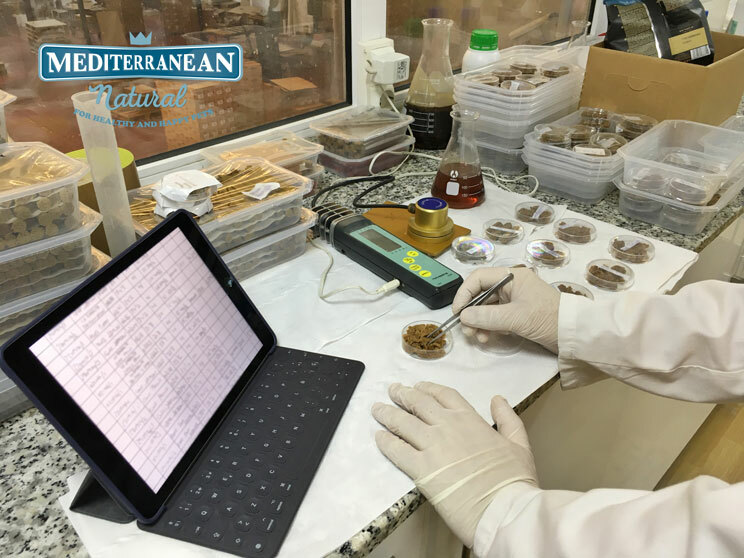 The biggest beneficiaries are our customers, who can enjoy the Mediterranean Natural products giving to their pets treats and semi moist food subject to a meticulous system of control in matters of food safety and quality. In Mediterranean Natural we prepare snacks and semi moist food for your dog with raw material of first quality and Spanish origin, without gluten or artificial colourants. Mediterranean Natural helps keep your dog healthy and happy.